Remove the skin of Ash gourd. Grate it using the big whole in Grater. Take 2 cups of gratings. Place the pan on the stove and transfer the gratings to it and cover the pan with a lid. The Ash gourd will start cooking with its own water content. Keep stirring the Ash gourd now and make sure that it does not stick to the bottom of the pan. When it is completely cooked, add the Jaggery powder or Palm crystal powder as per your choice and keep sauteing the mixture. The whole mixture will form a lump and come to Halwa consistency. Turn off the stove at this stage. Add Cardamom powder and dry Roasted Cashew nut pieces. Serve hot or warm. I was going through a few Ash gourd Halwa recipes on internet. Most of the people use Ghee and white sugar in it. I just thought of making Satvik version and tried this method. The Halwa came out tastier. So I am sharing the same recipe here. Ash gourd will turn out transparent when it is completely cooked. Still it will not become mushy. So you have to be careful while deciding whether Ash gourd is cooked well or not. Also the kind of Ash gourd you buy will dictate the final Halwa's taste. Some Ash gourds are sour and some has very subtler sour taste. Also some will have a spongy texture and some will have pulpy texture. In my personal opinion, using Palm crystal powder for sweetness gives the taste of sugar. When I use Jaggery powder, it gives slightly tangy taste. You may try both types and choose your favorite version. 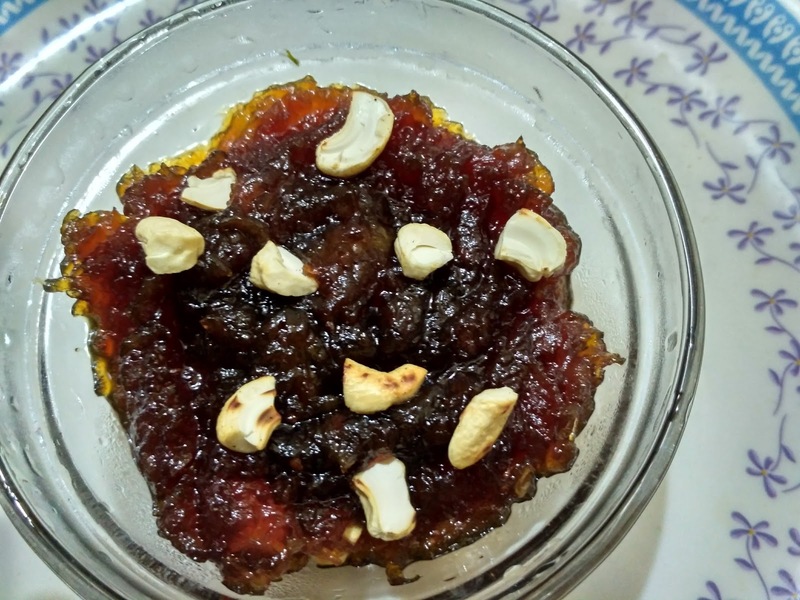 You can also make Carrot and Beetroot Halwa using this recipe. Check this out for a different version of this Halwa.